Reverend G has found the kind of fairy tale romance that everyone dreams of having, whether in the secular world or the world of nonbelievers. Chris is the perfect man. He believes in God. He believes in her. And he believes in the miracles that God has laid before him with a second chance at love, the woman he has shared as a friend and colleague. During what Reverend G affectionately refers to as their honey month, the test of what the two face crashes around the two elderly lovers. Faced with the ravages of Alzheimer’s, the two are forced to cut short their vacation to return to the security of assisted living at Cove Creek. A former minister, Reverend G happily rejoins the comforts of Cove Creek, befuddled but content that she and Chris can continue to enjoy their life together. But Alzheimer’s creates a guilt in the good reverend’s heart that her loved ones must endure the painful transition into a more cautious existence. 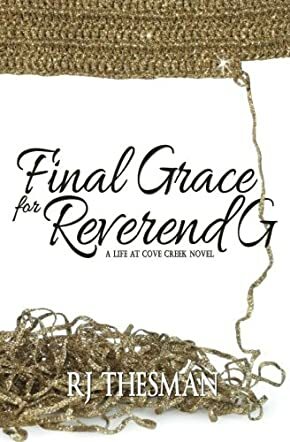 While Reverend G and her cat work to offer peace during the last moments of Cove Creek’s residents, Reverend G prays for that very solace for her own inevitable graduation from earthly life to Heaven’s gates. Final Grace for Reverend G by RJ Thesman is a moving, often humorous visit into the mind of a victim of Alzheimer’s disease. Thesman’s command of simile and humor bring a smile to the heart and mind of the reader in a tightly woven tale of the desperate emotions of one suffering from an incurable condition. Intertwined with religious references, there exists an obvious secular romance that exudes hope. I have never read such an uplifting story of heavy sadness. I thoroughly enjoyed this. I love Reverend G!